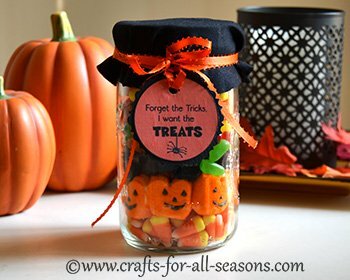 This Halloween candy jar is the perfect Halloween gift for any candy lover this season. It is easy to put one (or several) together and they look wonderful on display as part of your October decor. I include a free printable tag for the project too, so it is easy to dress up the lid. 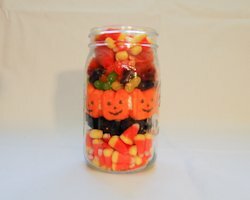 Brightly colored candy is enough to dress up a Mason jar, or any other used jar you may have around. 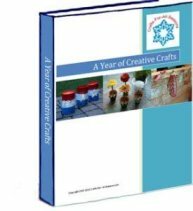 This project was sparked from a suggestion on the Crafts For All Seasons Facebook page. 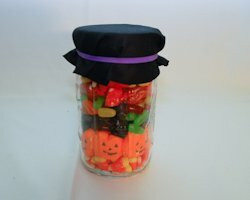 Thank you Kayla for requesting a Halloween candy jar craft! Do you have a project you would like to see? I love hearing from you! Feel free to voice your ideas here or on the Facebook page. White Cardstock and Printer for the Printable tag (template included below). 1. 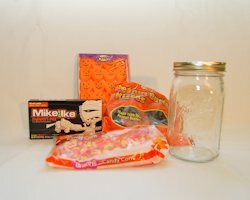 The steps to assemble the Halloween candy jar are very easy. You want to begin by adding in small amounts of one type of candy. I used candy corn first. This will be the bottom layer. 2. Next, create the next layer with another type of candy. Try something with a contrasting color. I put the Pumpkin Peeps in next. 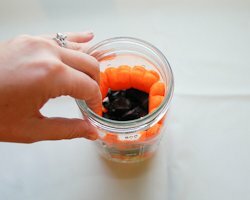 I found out through trial and error to add the Pumpkin Peeps near the bottom of the jar so you can see them well. 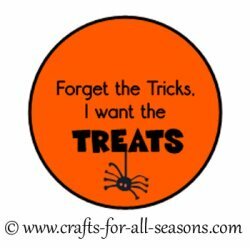 At the top, some of the layers will be covered up by the Halloween treat tag. 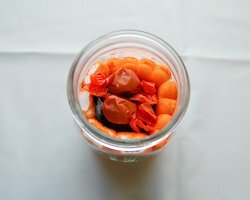 To add the Pumpkin Peeps, stand them up and wrap them around the inside of the jar, as shown. You can fill the middle section with some type of filler candy. 3. Continue layering your candy until you reach the top. 4. 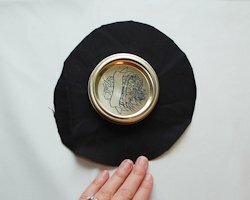 To decorate the top of the jar, cut a round circle, about one inch or so larger than the size of your lid, from black fabric. 5. Place this on the top of your jar, and use a rubberband to anchor it (so much easier than trying to keep the fabric down while you tie a ribbon). 7. Cut out the tag. If you like, you can glue the cut tag on black cardstock and cut around the circle, to mat it. 8. Punch a hole near the top of the tag with a hole punch, and thread the ribbon on through. I like to thread a ribbon loop through the hole, so the tag sits flat. 9. Tie the ribbon around the top of the rubberband to hide it. There you go! 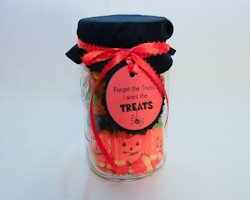 This Halloween candy jar is a cute gift, or a colorful Halloween decoration until you decide to devour it!